New to me, but Mobile Europe has apparently been around for 14 years as a controlled circulation (meaning it’s distributed for free to industry professionals) print magazine covering the mobile telecoms industry with a euro-centric focus. It also has a website and this mobile website. 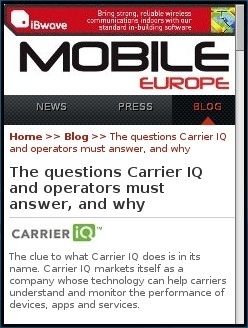 The other thing I like about Mobile Europe is the mobile site design. It’s a one size fits all affair that manages to strike a nice balance between looking modern and graphically interesting in the decent browsers on Android, iOS, etc. yet was still responsive and usable in the legacy Openwave browser of a low end feature phone I tried it on. This entry was posted in Mobile News and Reviews and tagged mobile, mobile site review, Tech by Dennis Bournique. Bookmark the permalink.